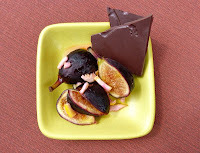 Today was the last day (Day #7) of Chocolate and Fig Theme Week, and I indulged a whim to pair chocolate with licorice and figs. The result: a plate of fresh figs marinated in Pastis (a French anise flavored apertif), sherry, saffron-infused honey and lemon peel -- paired with pieces of a Black Licorice Bar from American craft chocolate maker, Patric Chocolate (Columbia, MO). 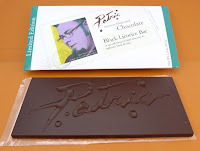 Patric Chocolate's Limited Edition (from July 2013) licorice bar was full of flavor and smooth in texture. This bar was infused with organic anise seed, house-made licorice extract from organic licorice root, and a touch of sea salt. The bar was soy and gluten free.